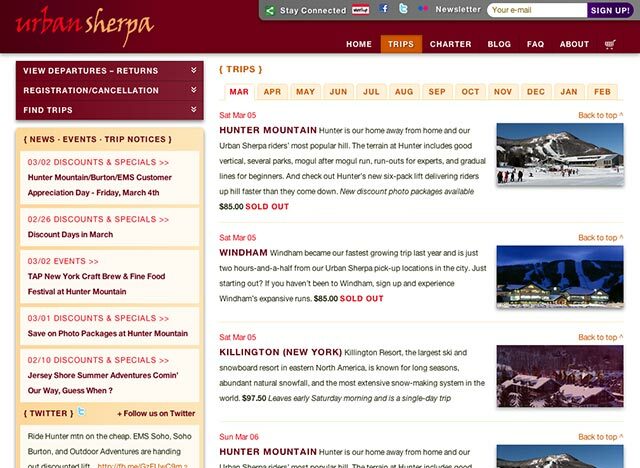 Urban Sherpa is an online travel portal organizing seasonal, specific single-day and multi-day adventure coach tours to local mountains, from New York and Boston. 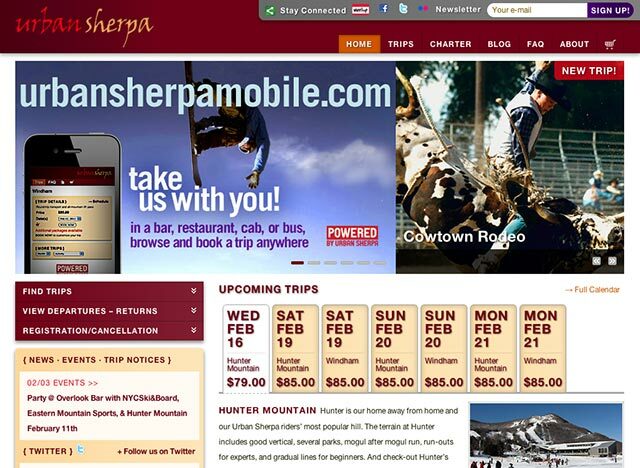 With Powered by Urban Sherpa, they partner with national and local industry leaders, such as Burton and EMS, to extend marketing opportunities and brand presence directly to the activity sites. Under the US Bus imprint, they also charter motor coaches and limousines. We overhauled the dated look-and-feel with lively colors and effective typeface treatments and revamped product and information presentation. Just as important, the action bustled behind the scenes: we thoroughly modernized the code base and outfitted the site with an integrated content-management system and specialized shopping cart and roster system. We paid particular attention to streamlining the interfaces for content and product/inventory management. To improve customer management, the site was retooled to provide clearer access to FAQ/policy statements and trip updates or announcements via an integrated business blog. Late in the project, the company announced an expansion into the Boston market; with our scalable setup we were able to accommodate the change of scope.